Home » Austria » How to get Austria Student Visa ? This entry was posted in Austria and tagged Austria Immigration Austria student visa Austria study visa Migrate to Austria stay in Austria study in abroad study in Austria on July 28, 2014 by Blog Author. Are you interested to study in Austria? Do you know the Austria student visa requirements and process? Here, you can find the necessary requirements and process of Austria Student visa. Austria is the one of the preferred destination for education by most of the students who aims to study and stay in Austria. The country is situated in the center of Europe; it offers high-quality education and supreme technical standards with low-tuition fees. Austria student visa allows overseas individuals to stay and study in Austria in various reputed universities and colleges. Applicants to fulfill their dream of study in Austria should obtain Austria student visa. With this visa students are permitted to pursue their education in Austria without any hindrances. However, to obtain this visa and to study in Austria applicants need to meet the following requirements. Under this visa, students are allowed to stay in Austria for an utmost period of six months. Applicants should have a lodging proof. Applicants must hold health insurance coverage. Applicants should be financially capable to meet their daily expenses during their stay in Austria. Applicants should also have a round trip ticket. Citizens of non-EU or EEA nations who would like to stay in Austria over six months should obtain a residence permit. 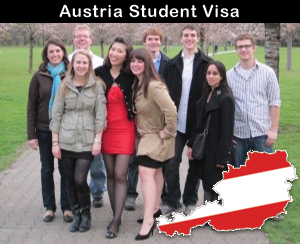 Applicants, those who meet the Austria student visa requirements, are eligible to apply for this visa. They must fill the visa application form very carefully in prior to its submission. After the successful completion of documents verification, Austria student visa will be issued. If you want to get this visa, fill MoreVisas Enquiry form, and also follow us @ Facebook, Twitter, Google+. ← How to obtain Australia Spouse Visa ?